Winter means your family will be wearing far more boots and coats, and it doesn’t take long for your hallway to look messy and disorganised (especially with kids leaving school and sports bags lying around too). Here are a few ideas to upgrade and update your hallway while giving them somewhere to store shoes, trainers, boots, bags, and coats. 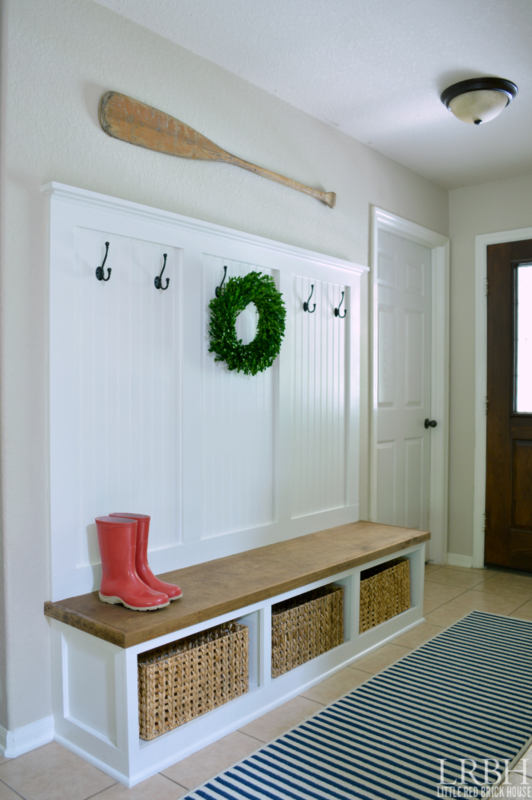 If you have a large wall and space to work with, this entryway mudroom would be perfect. It adds storage baskets to a bench to remove clutter and keep muddy shoes off your floor, and plenty of hooks for coats along with a shelf where you can keep bags, bits, and anything you need to remember when leaving the house. Don’t be fooled by the expensive look – most of this is made from simple painted plywood with timber boards for the details. If you don’t want to use baskets in the cubby holes, you can always make some simple boxes or just store shoes directly in the bench. You can find the full instructions on the Little Red Brick House blog. 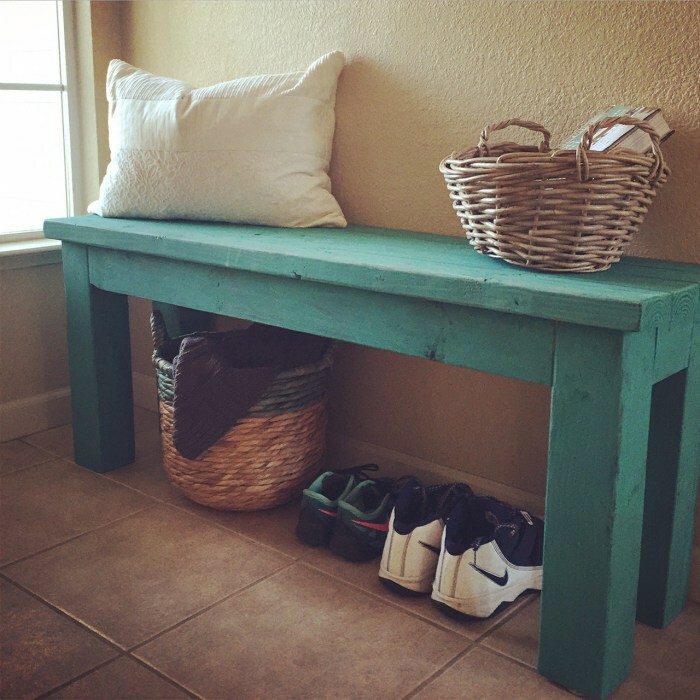 If you don’t want something quite that elaborate, or maybe your DIY skills aren’t there yet, this simple statement bench still gives you somewhere to keep shoes and bags. Based on a plan by Ana White, the dimensions give it a country feel with a slim profile so it doesn’t take up too much room in your hallway. The full tutorial is coming soon on the Domestic Heart blog. If you want something a little more elegant, this entryway bench is made from solid timber and you can stain it to suit your look and tastes. Erin from erinspain.com made it when she was 8 months pregnant, hopefully showing that it’s a simple and easy-to-make design. Take a look at the Erin’s Pain blog for full instructions and a list of materials. 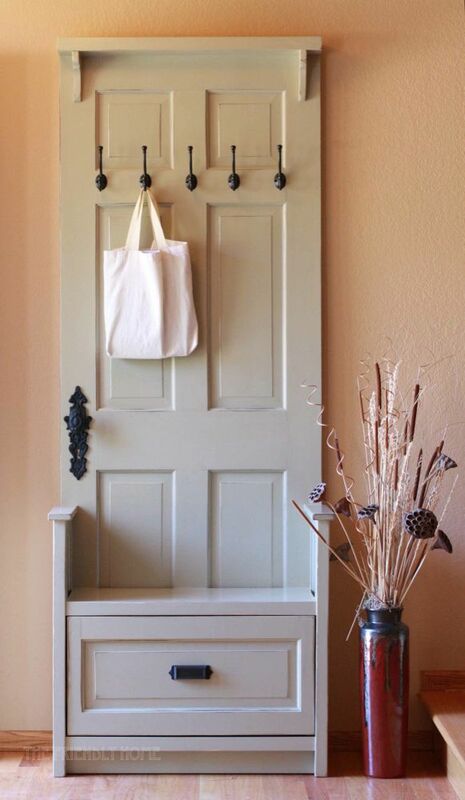 For something that’s slightly more unusual, you can make a hallway bench and organiser using a wooden door as a base. The instructions are available on the Friendly Home blog, showing you how to add the shelving, hooks, and even a drawer at the bottom for storage.